This is a self-adhesive stamp from a year 2000 booklet. The bird is a European Shag (Phalacrocorax aristotelis) which is one of the deepest divers of the shag family, it breeds on the rocky coasts of Western Europe and does not travel inland. 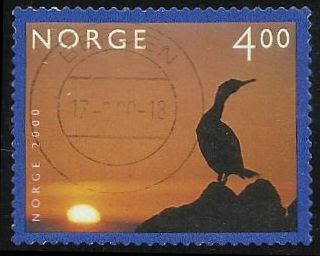 The stamp, cancelled in Bergen, Norway, is an ideal "traveling bird" as there is a full postmark with a legible name.